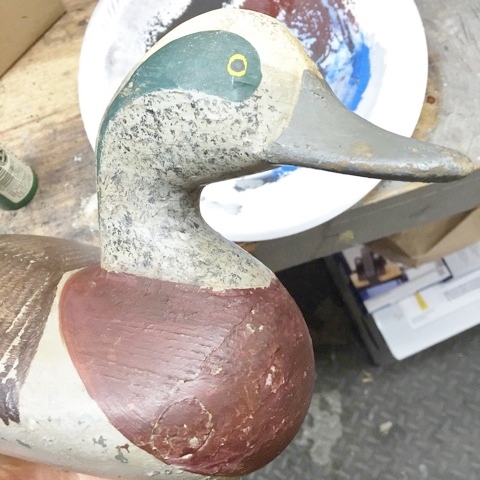 In need of restoring any of your decoys , get in touch with Spencer . This is a sample of some of the work done by Spencer . 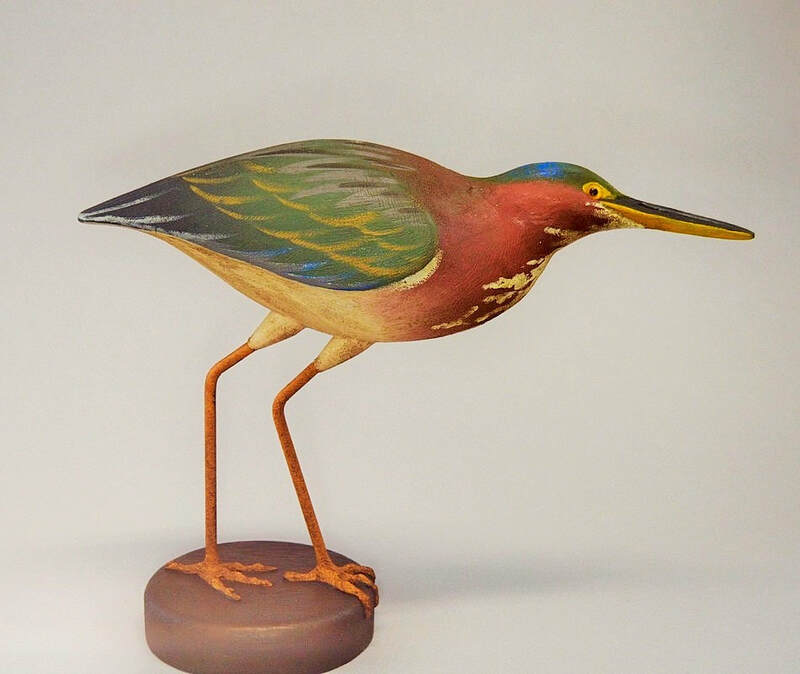 ​This Green Heron is approx. 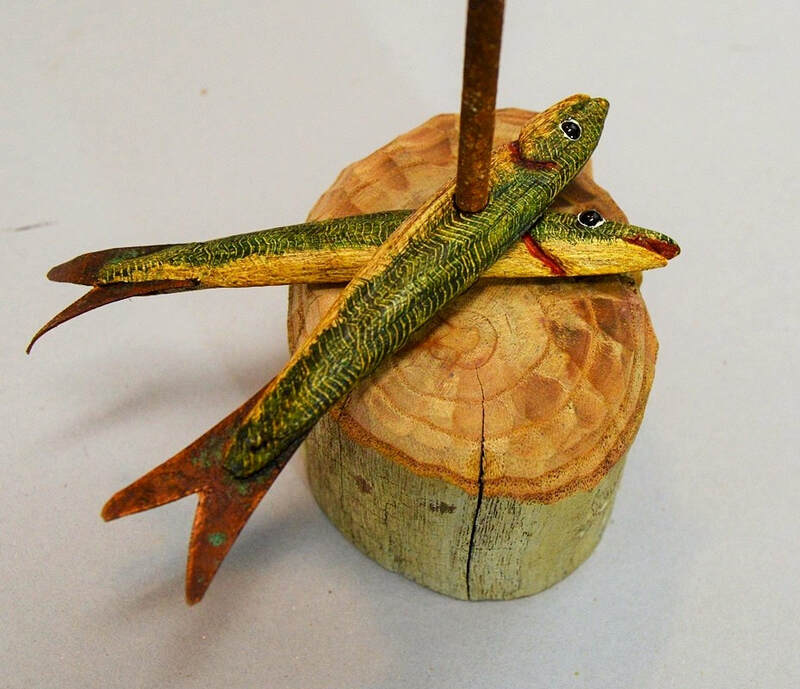 14" high and 18" long. 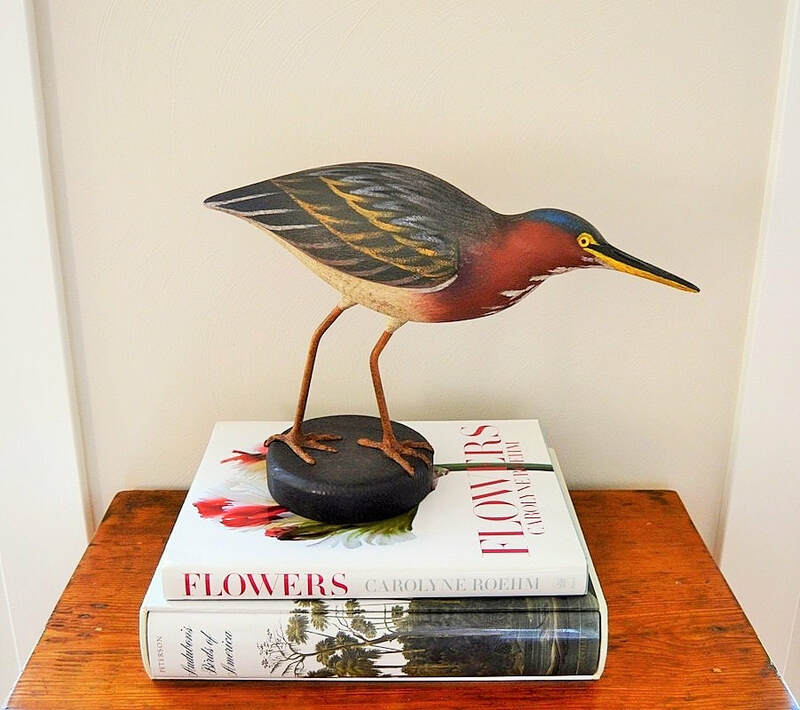 It is carved out of an old poplar support beam, which was collected from an early 20th century home that was being remodeled in Norfolk, VA. All of the carving and rasp marks were left, to give the piece a genuine hand-sculpted appearance. The eyes are antique doll eyes. 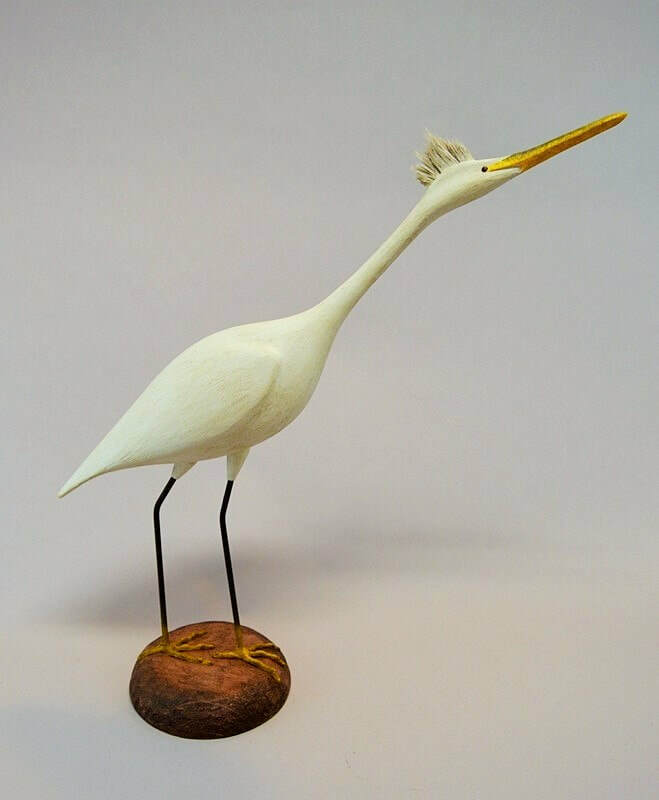 The bird is clenching a weighted base that prevents the piece from tipping over. The piece is painted in oils that were mixed from scratch, using raw pigment powders. Signed "TINK", under tail. 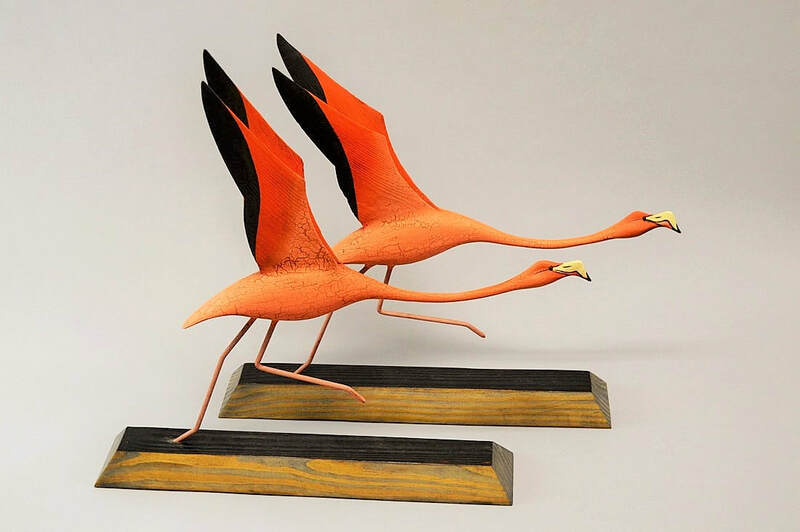 ​ In Flight Frozen in motion, these 1/3 sized Flamingos are in a sprinting posture as they try to take off. 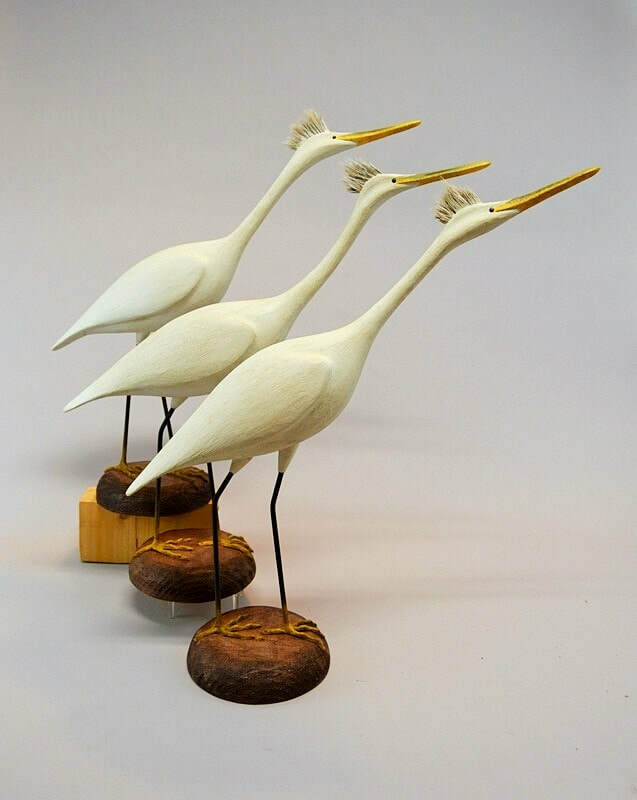 These birds are carved out of several different types of wood. The wings are cedar pier planks that were salvaged from the Elizabeth River in Norfolk, VA. The body is yellow pine, which was a support beam from a turn of the 20th century house in Norfolk, VA. 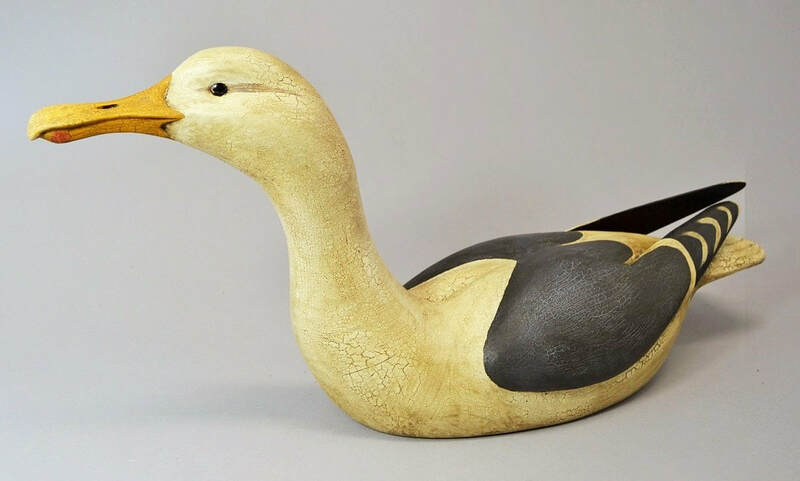 The head/neck are carved out of basswood, from an old bed headboard that was saved from trash day in Norfolk, VA. The legs are made out of threaded steel rod. The base was salvaged from a burn pile in Virginia Beach, VA. The eyes are onyx beads that were part of a necklace that was found in a Norfolk, VA dumpster. Each piece measures approx. 24" long, 21" high, and 4" deep, and is permanently attached to the base. They are painted in oils that are mixed from scratch using raw pigment powders. Signed "TINK". 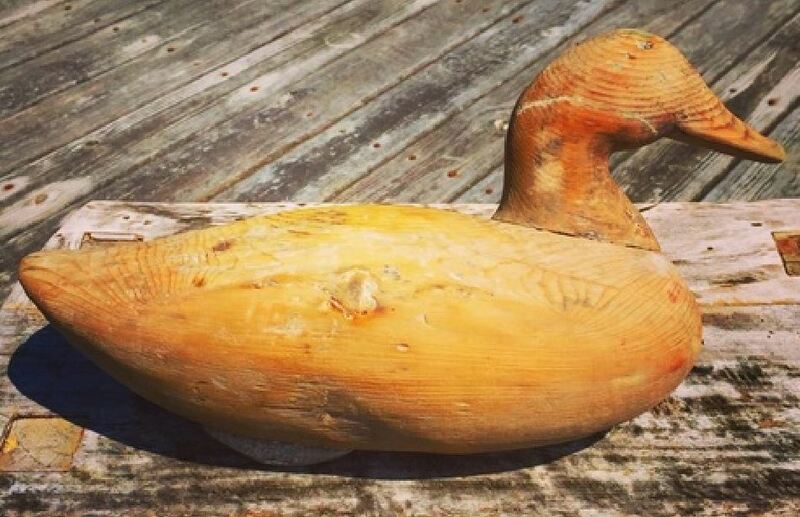 This piece began life as a solid maple bowling pin, which was found in a dumpster behind a Norfolk, VA antique shop. 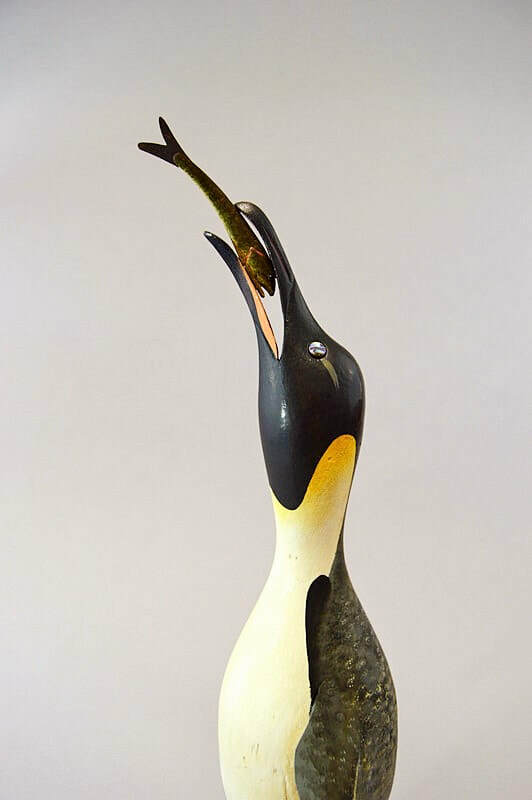 Though the idea of sculpting a "pin-guin" was formulated shortly after finding the bowing pin, it wasn't until a recent trip to the Chicago Field Museum that the "pin-guin" began to take form. The flippers are made from metal siding, which was salvaged from a collapsed chicken coop. The eyes are abalone shell, and the fish is carved from a cedar tree branch. 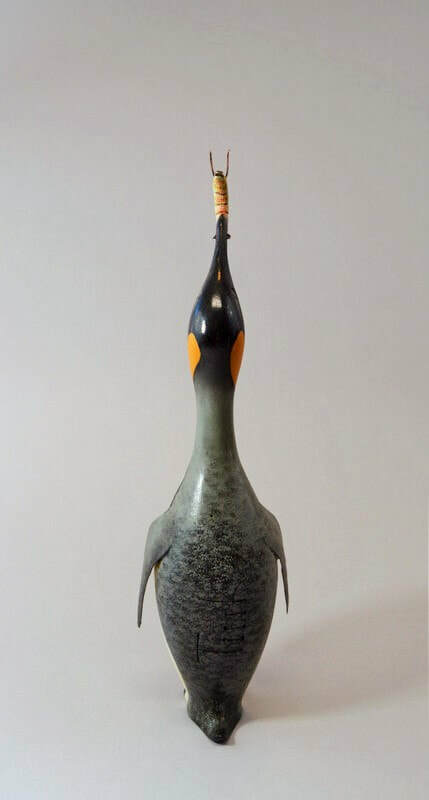 A piece of poplar was added to the top of the bowling pin to create a beak/face. The feet and tail are carved out of salvaged pine shelving. This piece measures approx. 21" tall, 5" wide and 7" deep (from flipper to flipper). 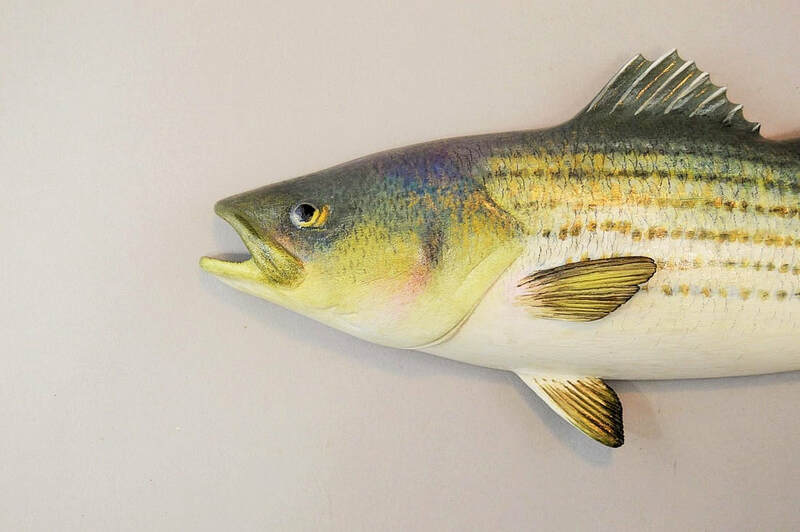 Fittingly, this Striped Bass is carved out of basswood. The pelvic and pectoral fins are carved out of salvaged oak flooring and inserted into the body of the fish. The eye is carved into the piece. 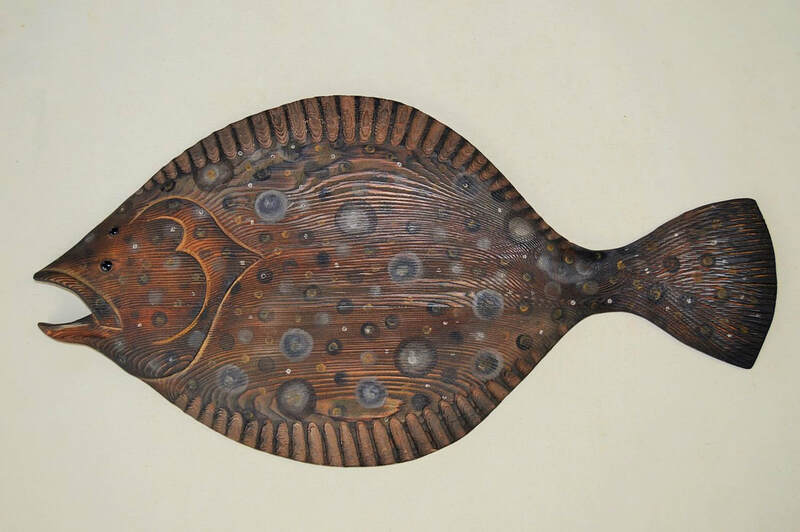 The fish is painted using a combination of mediums; oils mixed from scratch using pigment powders, artist tube oils, and copper dust for iridescence. Signed "TINK". 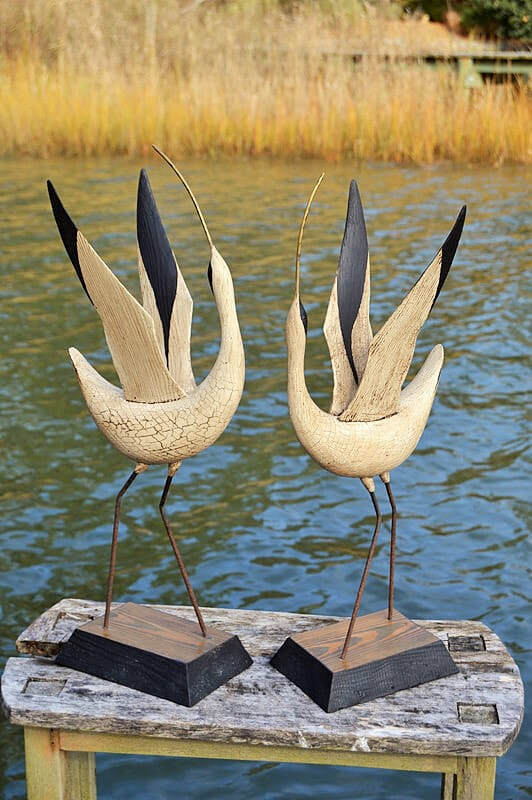 ​The Dancing Avocet are sculpted out of white pine log home cutoffs from the Adirondack NY area. 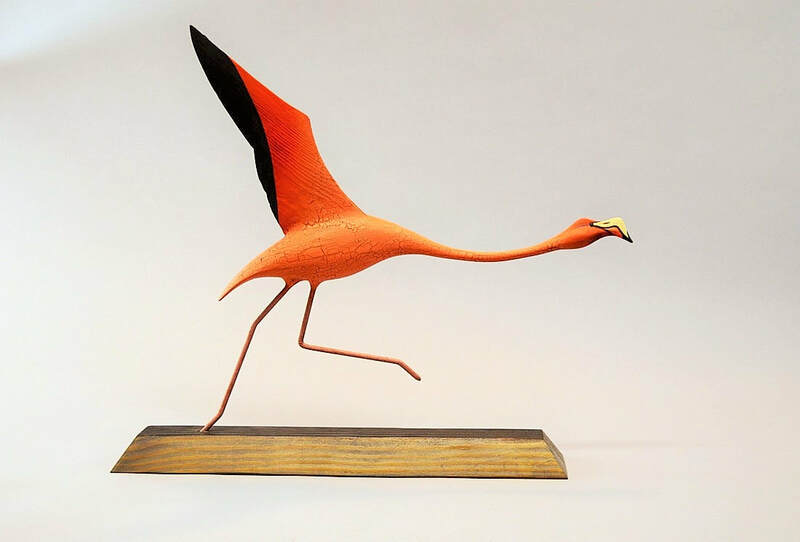 The wings are carved from cedar fishing pier planks that were salvaged from the Elizabeth River in Norfolk, VA. These birds have unique brass bills, which were found on a nearby beach in Norfolk, VA. The birds have petite onyx eyes that came off of a necklace that was found in a Norfolk, VA dumpster. 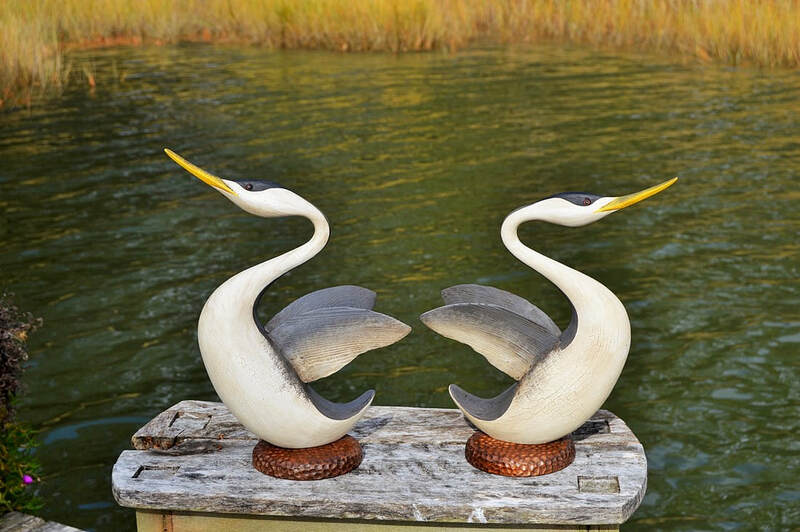 The legs on these birds are discarded welding rods that were salvaged from the same river as the Norfolk and Portsmouth naval shipyards. The bases are made from beautiful old heart pine floor joists that were salvaged from a Norfolk house, which was built at the turn of the 20th century. 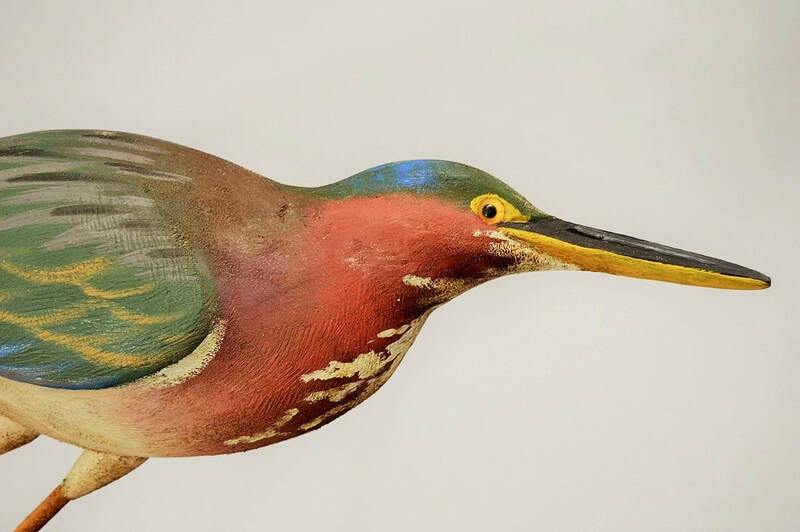 These birds are painted in oils that were mixed from scratch using raw pigment powders. Signed TINK. 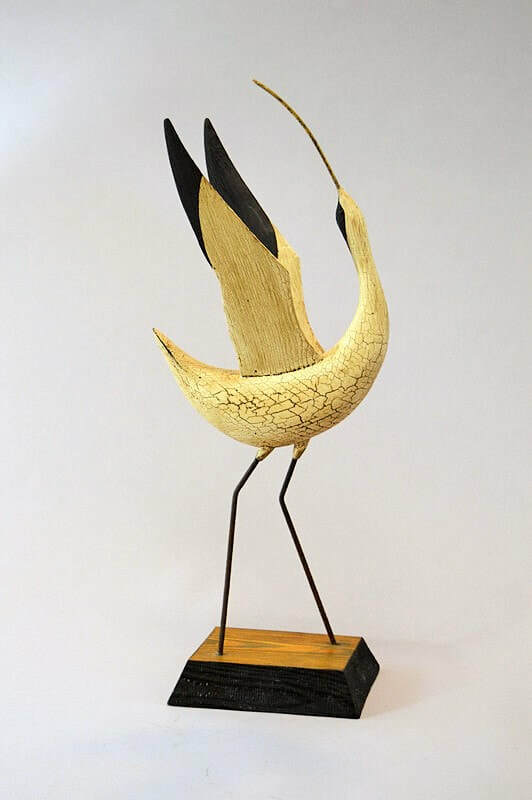 The concept for this piece was inspired by the composition of antique weathervanes. Belted Kingfishers are often perched in high places, to get a "birds-eye-view" of the scurrying bait fish below. 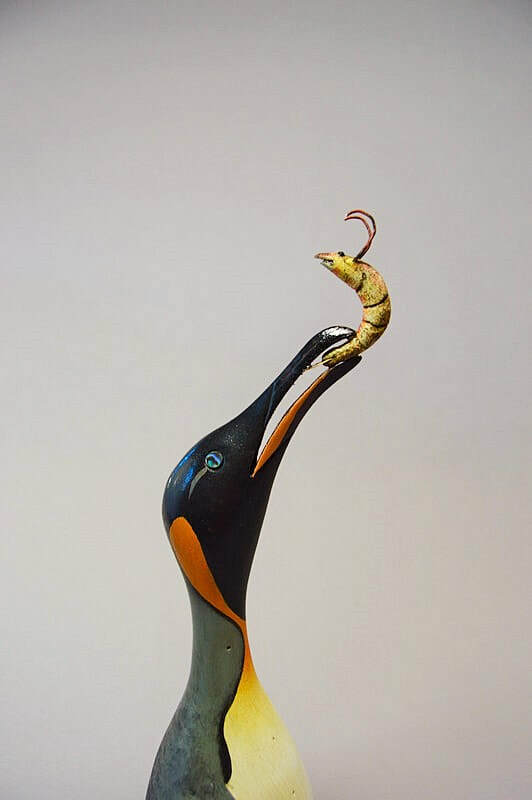 In this piece, the bird is positioned as if she was glancing at the fish below. 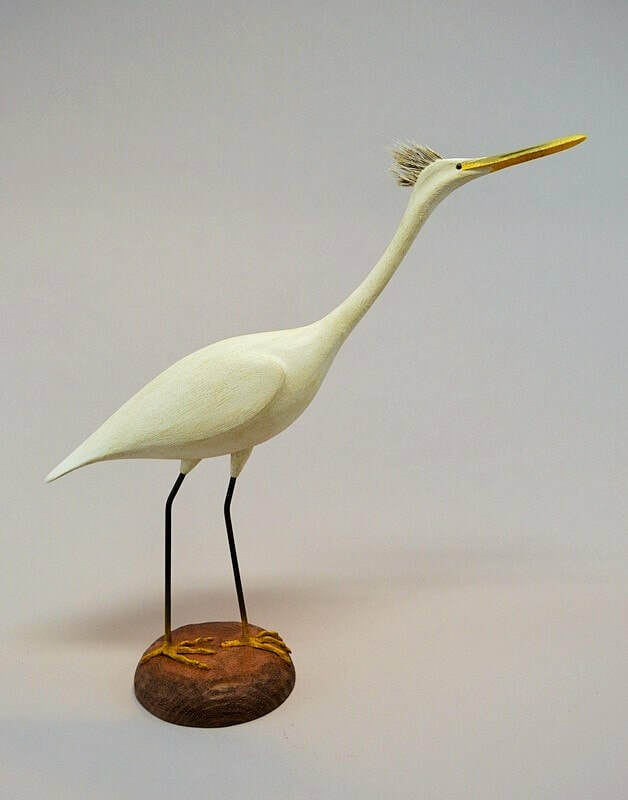 The bird is carved out of the same wood as the base, which came from an old cedar limb that was adrift in the historic Elizabeth River- Norfolk, VA. 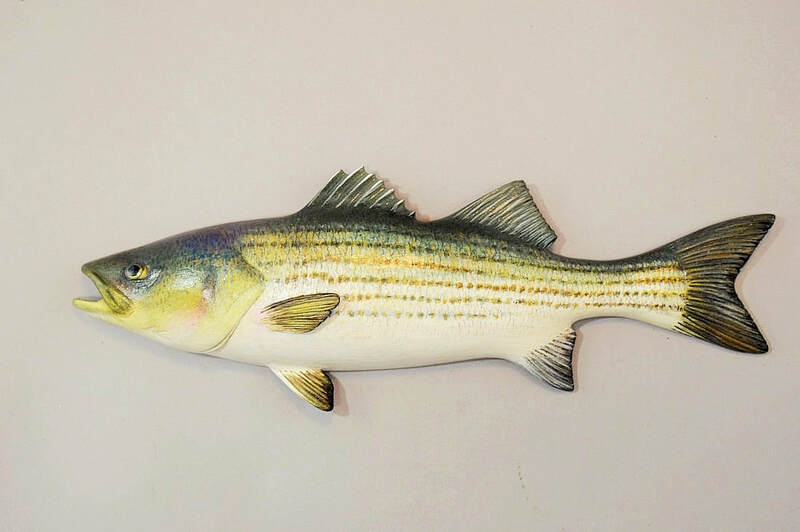 The fish, "directionals", are carved out of an old oak broom handle. The fish tails are copper flashing from underneath old roof shingles. 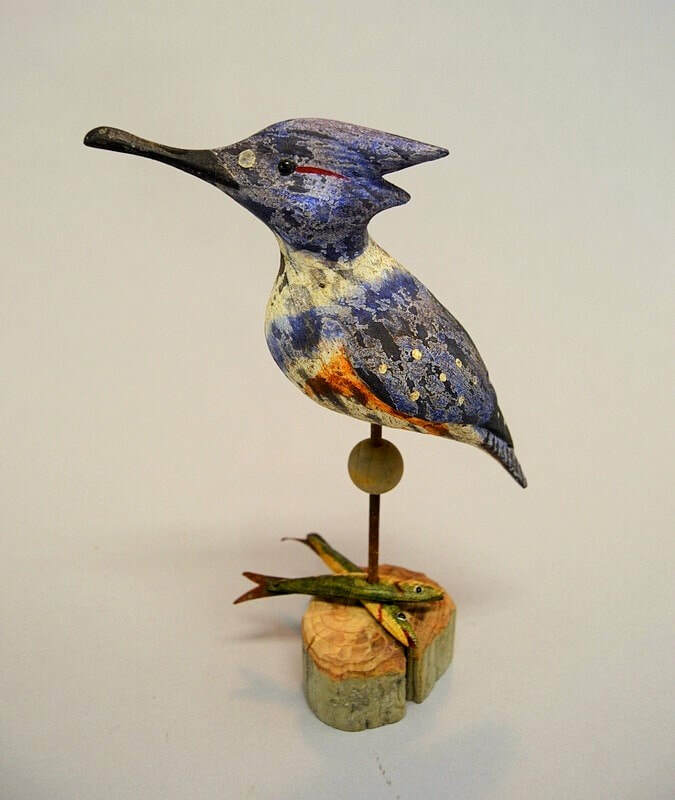 The bird sits on a weathered welding rod that was gathered around the shipyards. 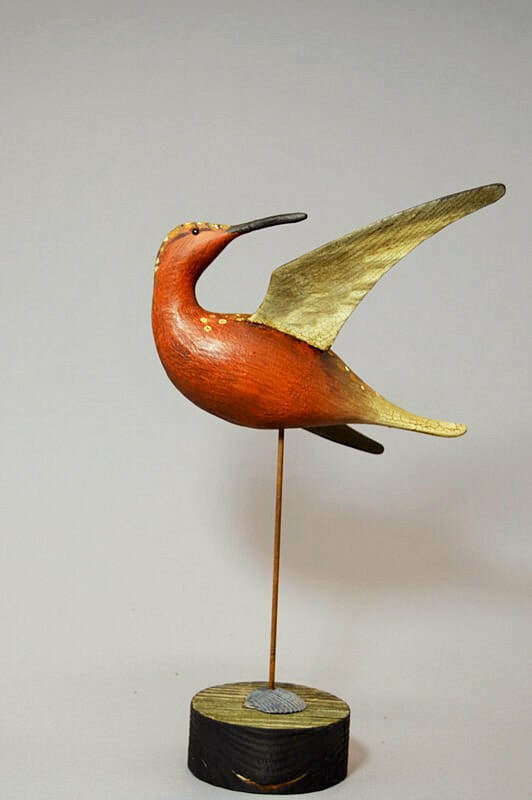 A wooden net float serves as the decorative ball that is seen in many antique weathervanes. The piece is approx. 11" high, 7" long, and 3" wide. It is painted in oils, which are mixed from scratch using raw pigment powders. Signed TINK. 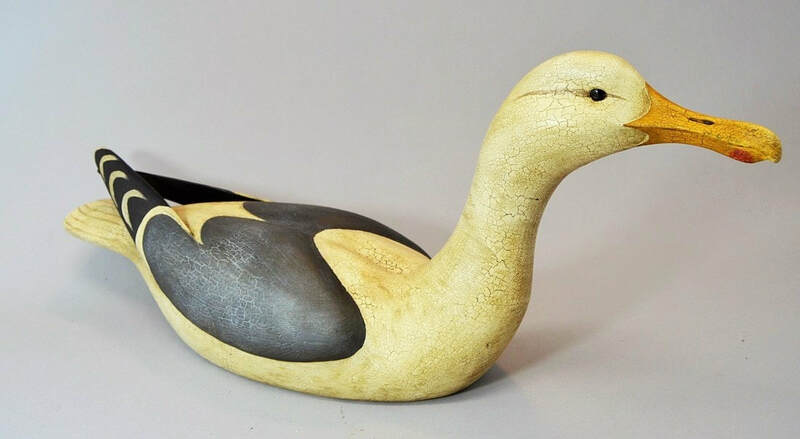 This large gull is carved out of Adirondack New York log home cut-offs. The eyes are onyx beads that were found in a Norfolk, VA dumpster. The wings are made out of poplar that was salvaged from an old bookshelf. 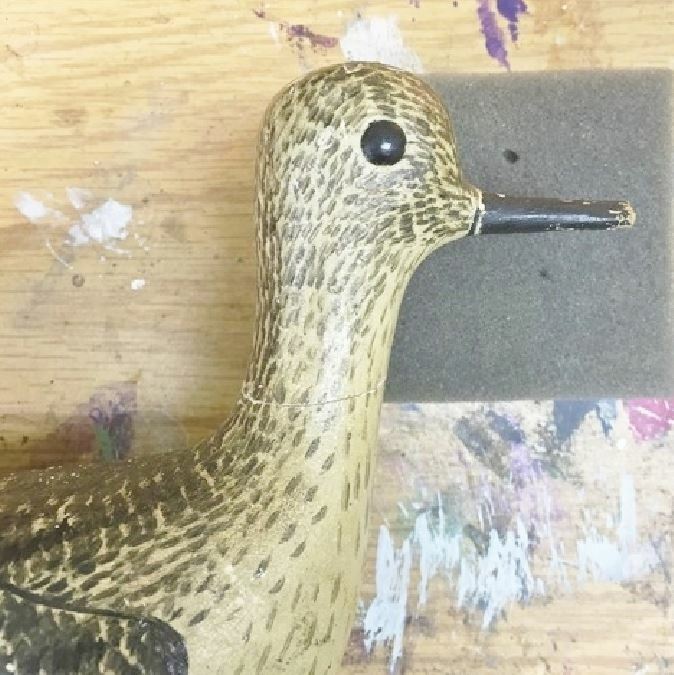 The bird is painted in oils that are mixed from scratch, using pigment powders. The gull's surface has a nice, aged craquelure. 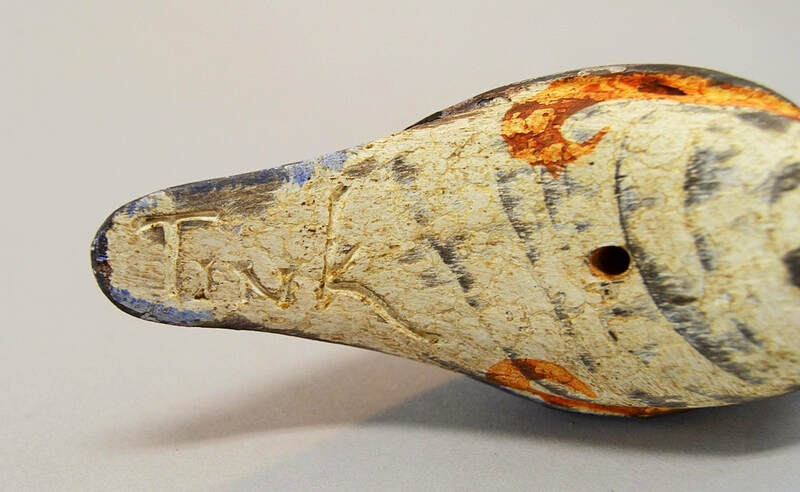 Details about the materials used to make the bird are written on the bottom of the piece. This Black-Backed Gull measures approx. 27" long, 8" wide, and 11" high. 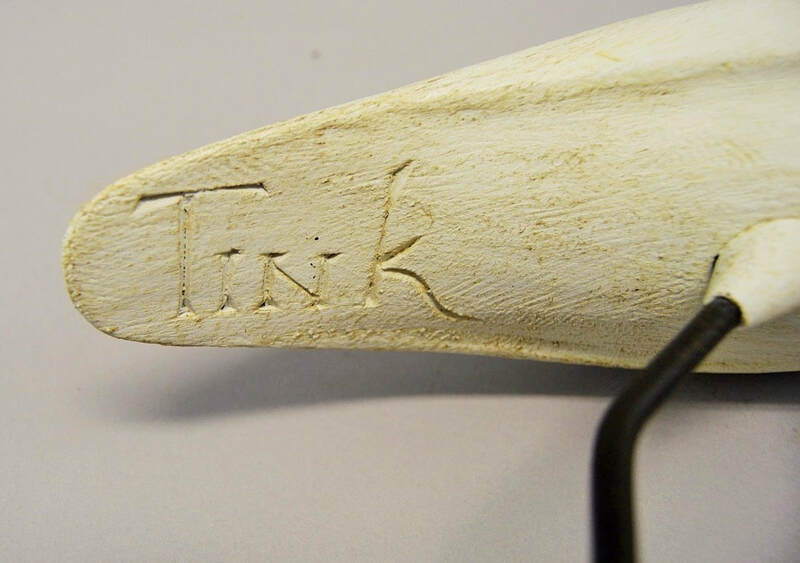 Incised "TINK" signature. 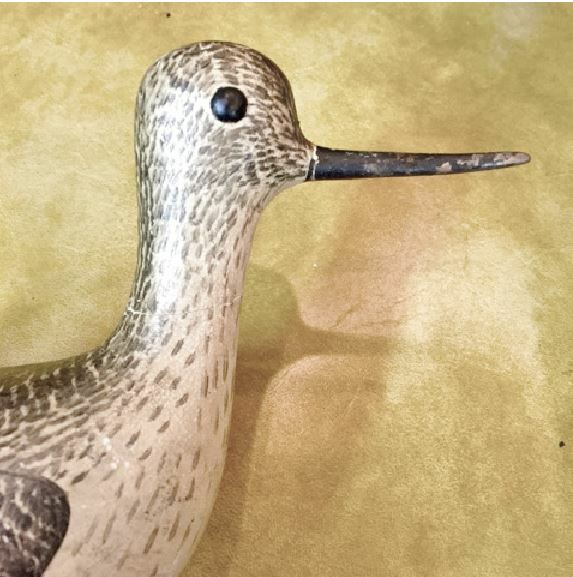 ​This Red Knot has both of its wings lifted off of the body. 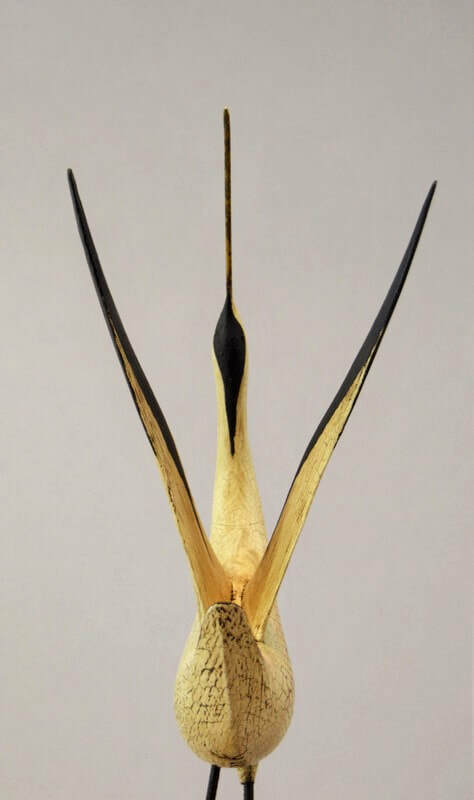 One wing is upright, while the opposite wing is drooped. 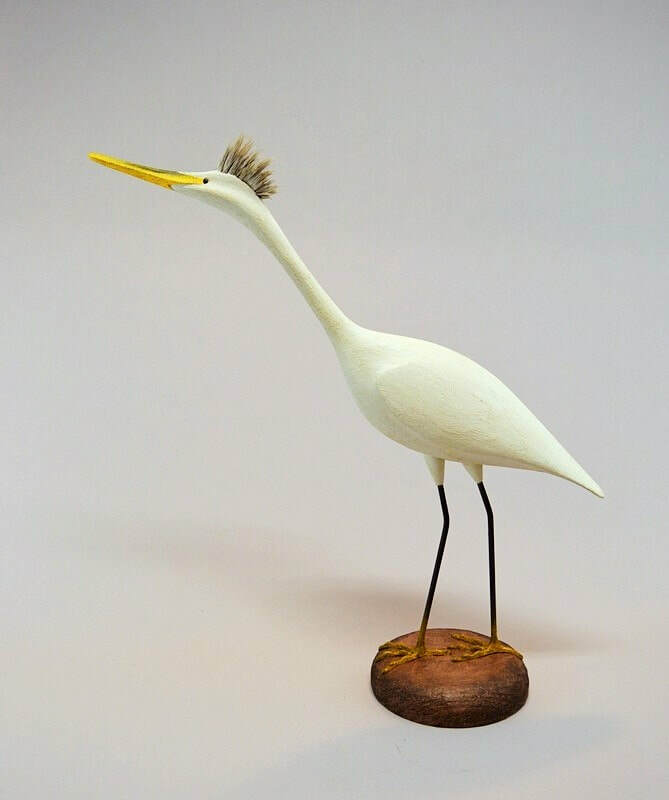 This bird is carved entirely out of materials that were gathered from the Chesapeake Bay and its tributaries. 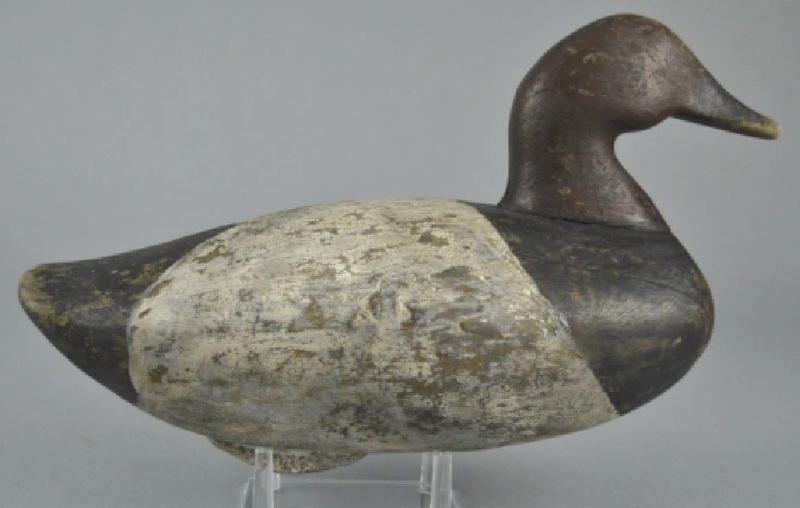 The body of the bird was carved out of an old nautical sign post. The wings and head is carved out of the same piece of wood as the base; a plank from my own pier. The bill and metal stand support are welding rods that were gathered from beaches around the Norfolk and Portsmouth shipyards. The eyes are onyx beads from a necklace that was found in a Norfolk, VA dumpster. A seashell, from the Elizabeth River, is placed between the wood base and the metal stand. This eliminates any right angles in the piece. The Red Knot is approx. 12” high, 8” long, and 4” wide. 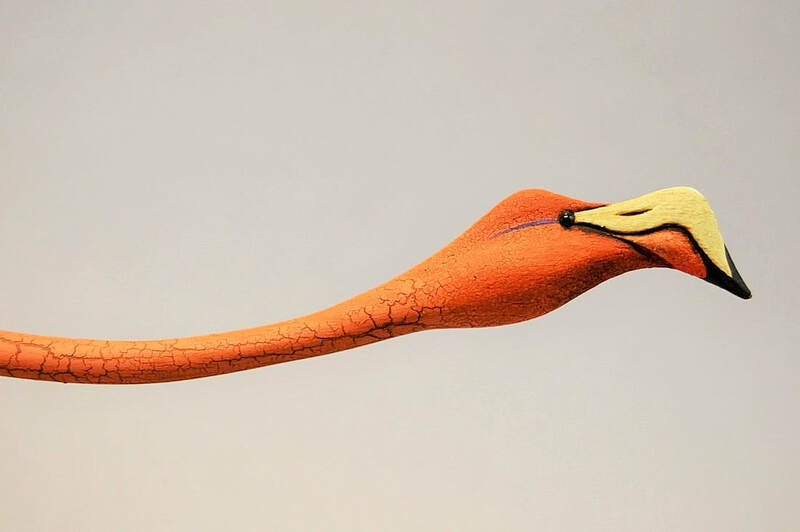 The bird is painted in oils that are mixed from scratch, using raw pigment powders. Signed “TINK”. ​There are plenty of graceful curves on these Grebes. 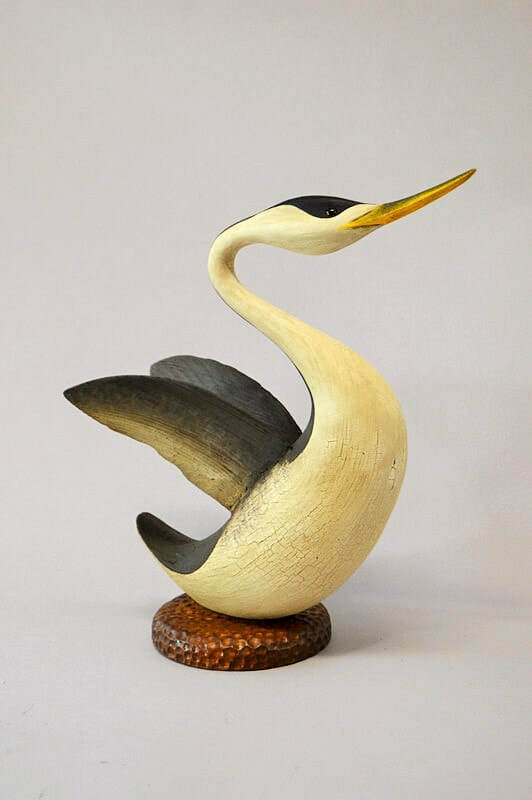 The Grebes are carved out of white pine log home cutoffs from the Adirondack NY area. The wings are cedar fishing pier planks that were gathered from the Elizabeth River in Norfolk, VA. The bases are carved out of wood found in a dumpster in the Fort Norfolk area. 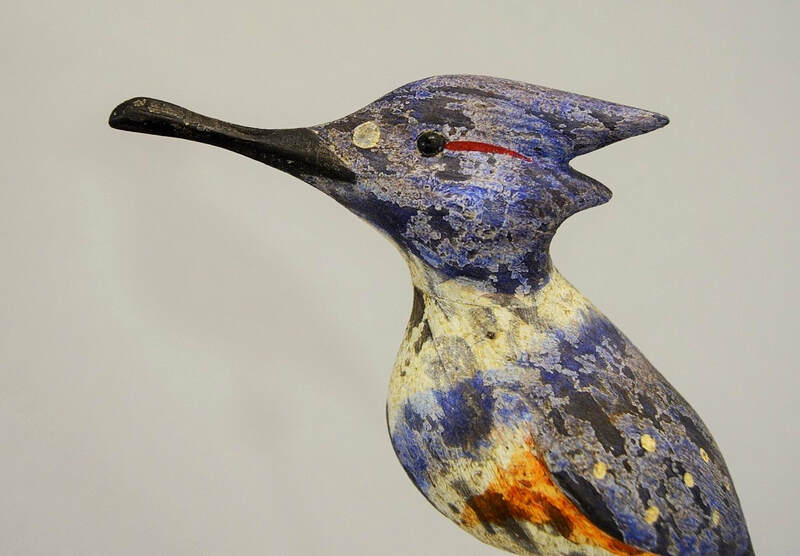 The birds are painted in oils that were mixed from scratch using raw pigment powders. 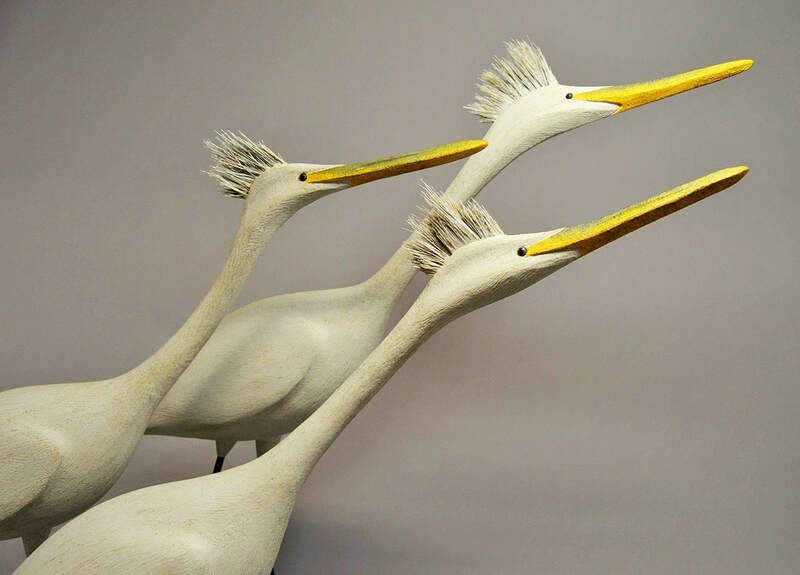 Signed "TINK"
​This trio of Petite Egrets have heads and necks that are carved out of tree branches, giving each of them unique personalities. 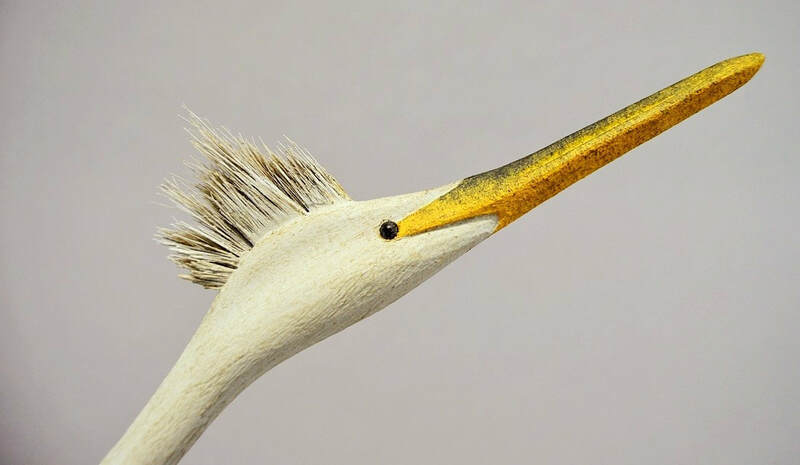 The crests of each Egret are made out of horsehair. The bodies of the birds are carved out of a poplar beam from an early 20th century house that was being remodeled in Norfolk, VA. 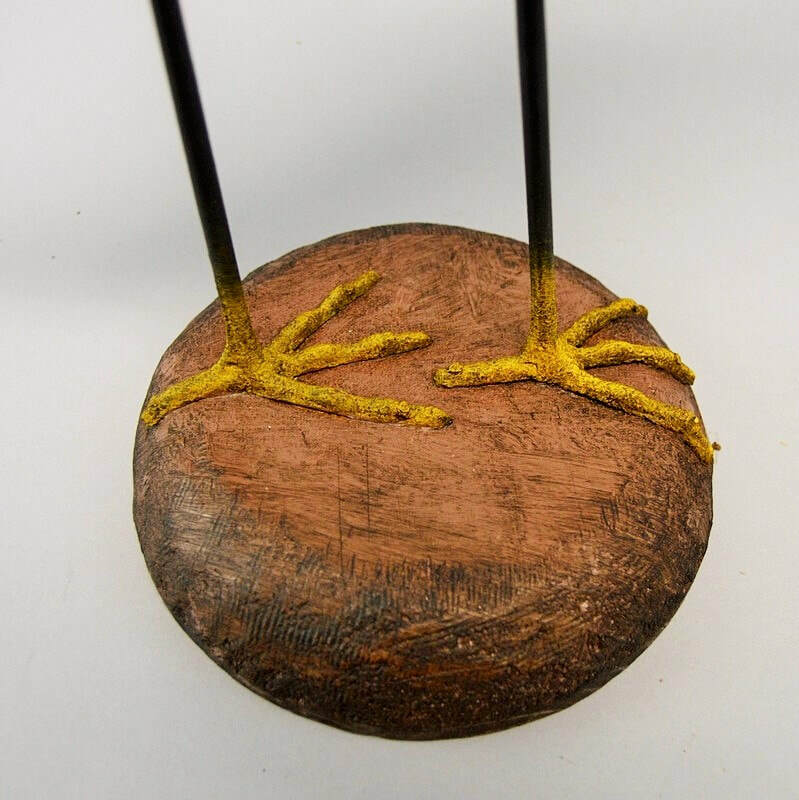 The legs of the birds are made out of welding rods that were salvaged from nearby shipyards. The knuckly feet are made out of metal, which I cast in a mold that I carved from a hard piece of cherry. Due to the high temperature of the molten metal, a limited edition of six feet were made, before the mold was destroyed from intense charring. The round bases are made out of an old pine fishing pier plank. The birds and the base have a hand carved, rasp texture that was left to show the unique character of the wood and the craftsmanship. 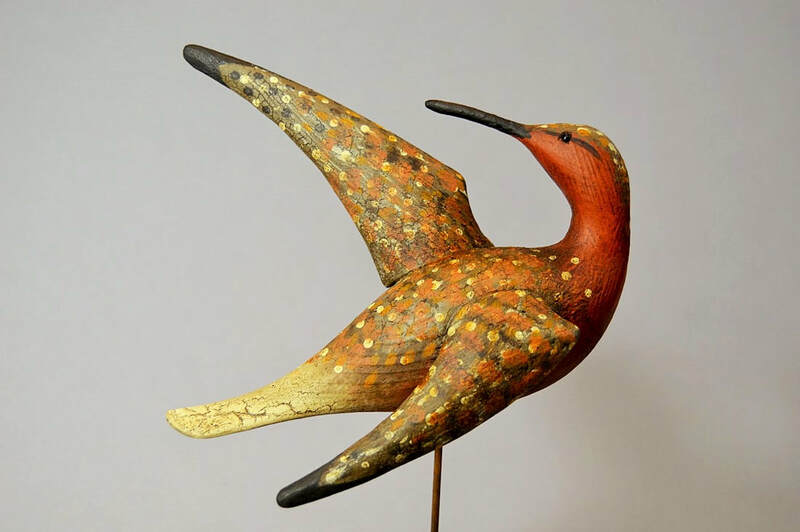 The birds are painted in oils that are mixed from scratch, using raw pigment powders. Each Egret measures approx. 23" high, 23" long, and 6" wide. 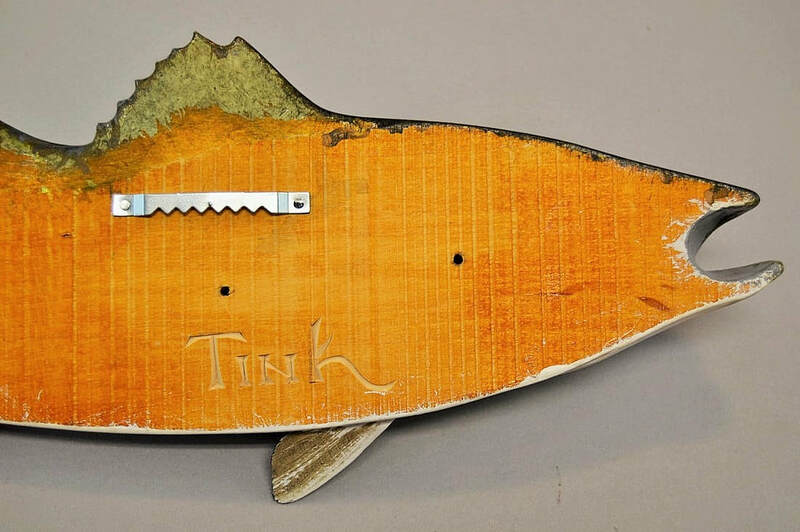 ​This flounder is made out of pier planks that were salvaged from the Lynnhaven River in Virginia Beach, Virginia. The planks were found close to First Landing State Park, where the the settlers of the Virginia Company first made landfall before traveling farther west to create the first permanent North American settlement in Jamestown. The fish is painted in oils that are mixed from scratch using raw pigment powders. 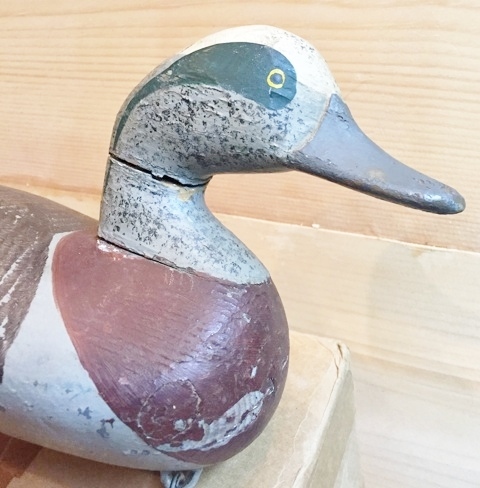 ​This piece began life as a solid maple duck-pin bowling pin, which was found in a dumpster behind a Norfolk, VA antique shop. 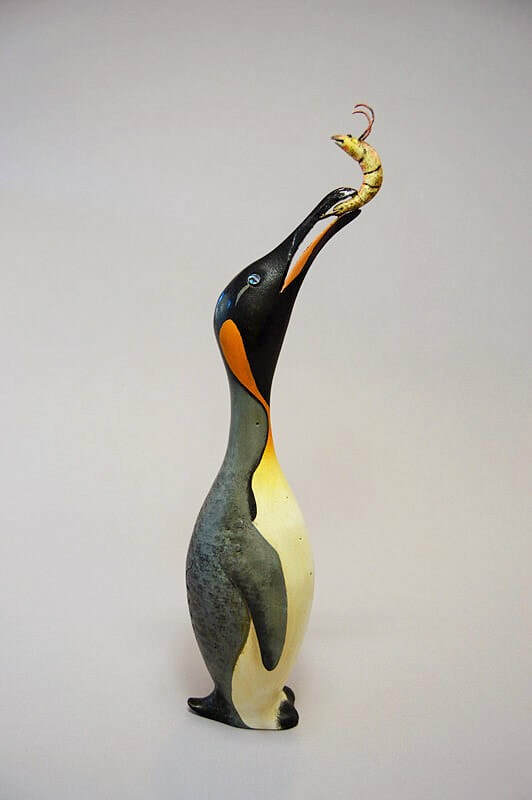 Though the idea of sculpting a "pin-guin" was formulated shortly after finding the bowing pin, it wasn't until a recent trip to the Chicago Field Museum that the "pin-guin" began to take form. The flippers are made from metal siding, which was salvaged from a collapsed chicken coop. The eyes are abalone shell, and the krill is carved out of a piece of pine shelving. 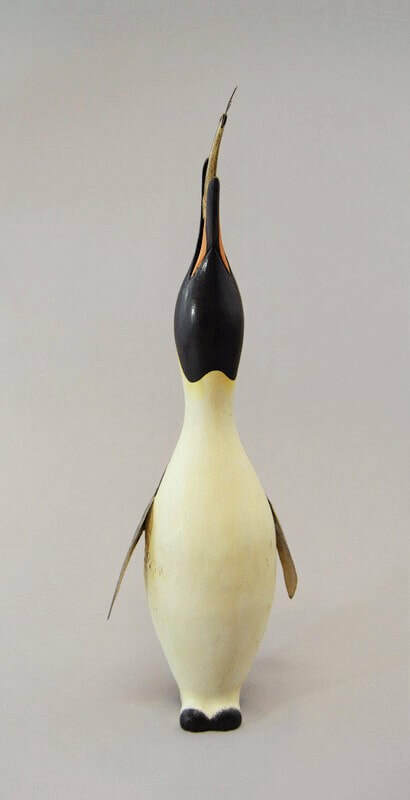 A piece of poplar was added to the top of the bowling pin to create a beak/face. The feet and tail are carved out of salvaged pine shelving. 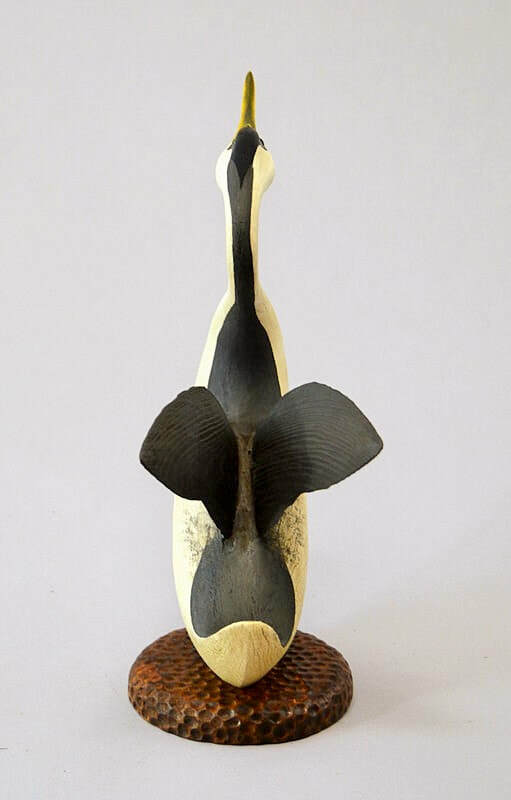 Contemporary Stylized RayCarved out of white pine, this ray is 18" from wing to wing, and has a tail that is made out of steel. This piece has a unique blend of oil colors that emulates a piece of marble. 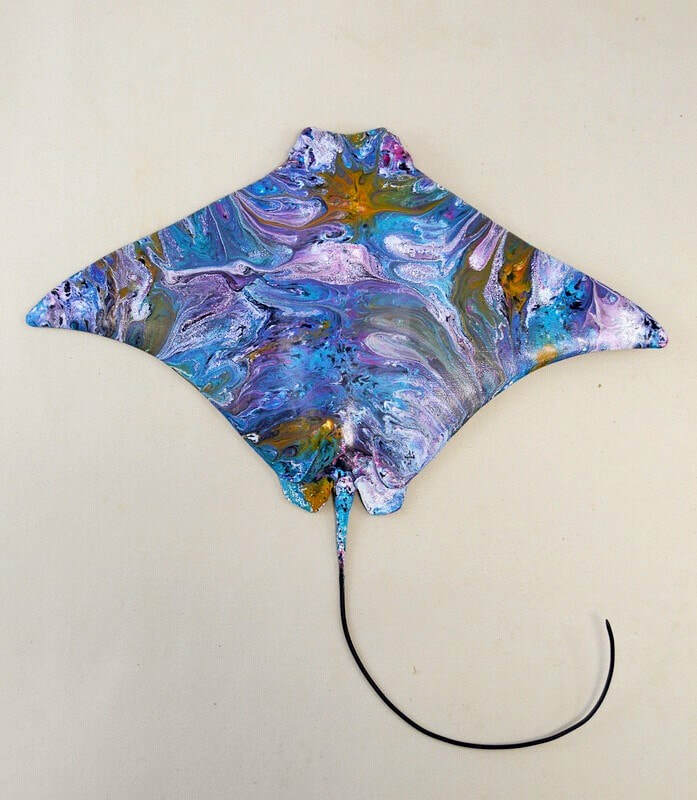 The ray has a hanger that allows it to be hung on the wall, however it may also be placed flat. Please email: SpencerTinkham@gmail.com for inquiries.